Do you even know how long this recipe took me to create and get right? Well, I’ll tell you – at least ten times. But I’m not a quitter when it comes to dessert, and I was super serious about this one. I was walking through the store about a month ago and saw a package of 8 Strawberry Shortcake cakes. They were stacked next to cartons of fresh strawberries and a can of whipped cream. I was never really into Strawberry Shortcake until that day. And then I sort of got fixated on it. 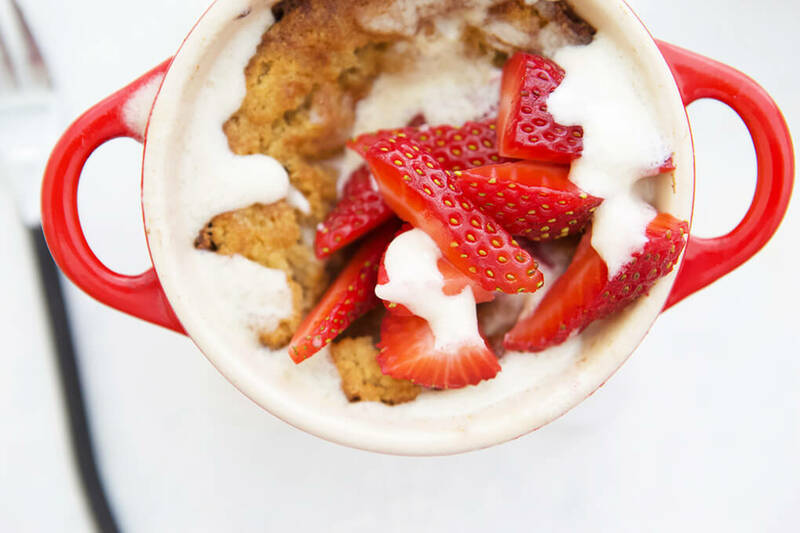 This was right around the time I was finishing up my 28 days of Rifaximin and Neomycin, so I knew that if I wanted Strawberry Shortcake, I’d need to make one myself, and I’d need to get crafty and creative with the ingredients – or maybe lack thereof. Man I’m difficult, you know?! 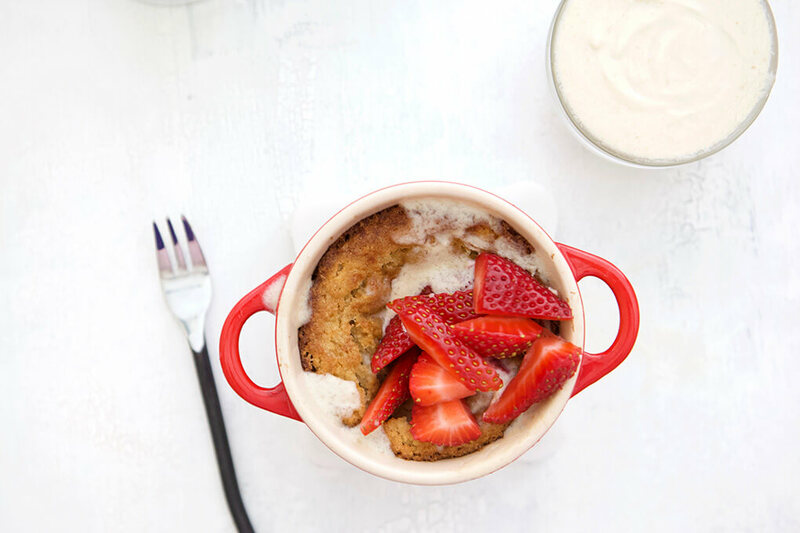 Click HERE to save the Strawberry Shortcake for One for later. So why did it take me so long to get right? Because making sure those 4 things were included was and is super hard to do. Let’s chat a little about the details. Almond flour vs. Almond meal. I wrote a blog post about the difference like 5 years ago, but there is a difference, and if you already have a super strict recipe, you have to be aware of the differences and that they aren’t necessarily one in the same. 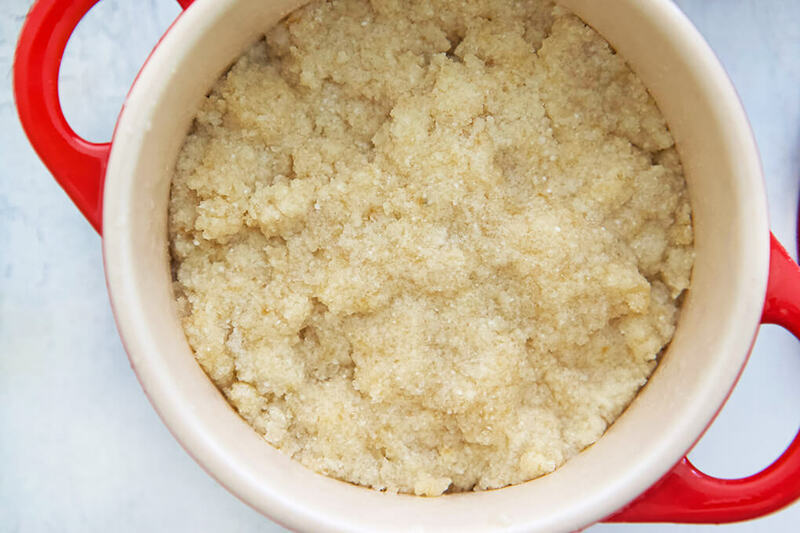 With this recipe, I tried using the Almond meal for the first 5+ times. It did not work. Carbs. There is nothing wrong with carbs – at all. In fact, if you saw what I ate this past weekend at the lake, you’d know I’m 100% legit on this one. That said, I will be perfectly honest with you. When my stomach is off, even if it’s just a little bit, I do hold back on both FODMAPs and high carb foods. They don’t work for me, and if you want more on it, just read Carbs and SIBO. At the time when I created this recipe, I was low carb. No eggs. I go back and forth with how I feel about eggs for my personal healing journey. On the one hand, yes, give me all the eggs. And on the other, I am almost certain there is a correlation between them and cystic back acne breakouts. I don’t completely ban them from my life, but I tend to tread lightly with them. A trick I learned over time, though, is that Gelatin is an amazing egg substitution when you’re baking. The bonus is that I believe in gelatin for gut healing. The first life-changing recipe I created doing this was my AIP Bread. (By the way, remember that you can get the AIP Bread recipe for free when you purchase The Gutsy Girl’s Bible: an approach to healing the gut, 3.0.) 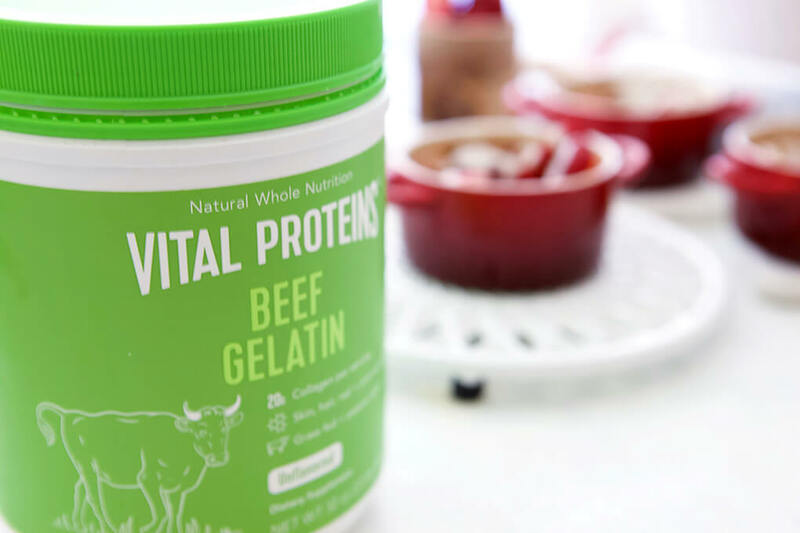 I always choose Vital Proteins Beef Gelatin because I trust the brand and have loved all their products. 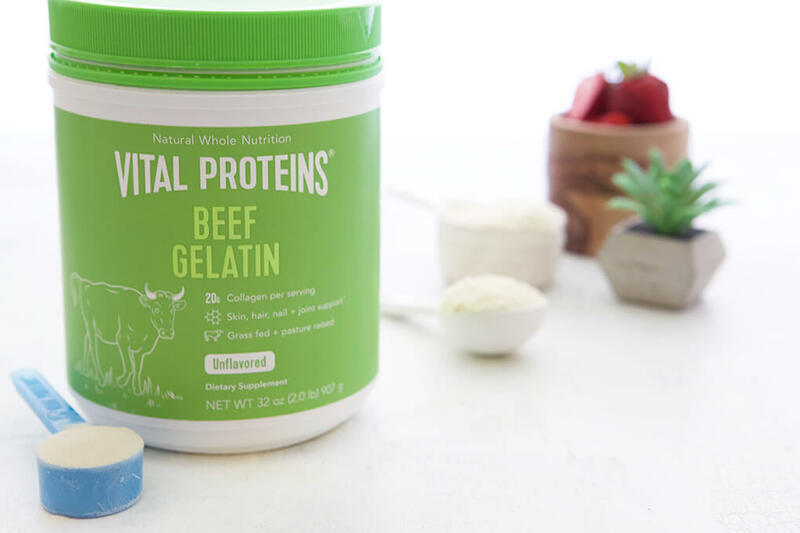 This recipe isn’t my first rodeo with the Beef Gelatin. If you watch my Instagram Stories, I am constantly adding it to all the things, and I’d guess I have 1+ Tbsp per day because (yet again) I believe in it for gut healing. Baking soda vs. baking powder. If you can’t do corn, then make sure to read the ingredients because baking powder contains corn. I can’t remember the last time I used baking powder, but baking soda and baking powder are different things, and most baked goodies require baking powder. How do I get around it? Baking soda + fresh-squeezed lemon. That’s the mixture that can replace baking powder (there are others, like baking soda and yogurt, but this is what I typically choose). That said, I started off using way too much baking soda and the cake tasted so salty. I cut the amount of baking soda in half about 8 rounds in. Almond extract vs. Vanilla extract. 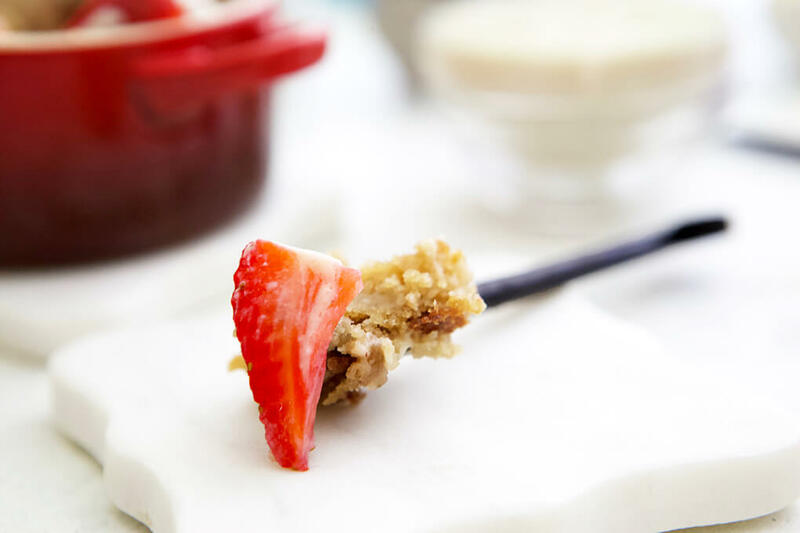 Most Strawberry Shortcake cake uses Vanilla extract; I chose to use Almond in mine, and I love the little twist. If you absolutely don’t want to make that substitution, you don’t have to. I have never tried it with the Vanilla, though, so I can’t tell you for sure what it tastes like. Microwave vs. Oven. Almost every single time I made this, I did it in the microwave. Why? 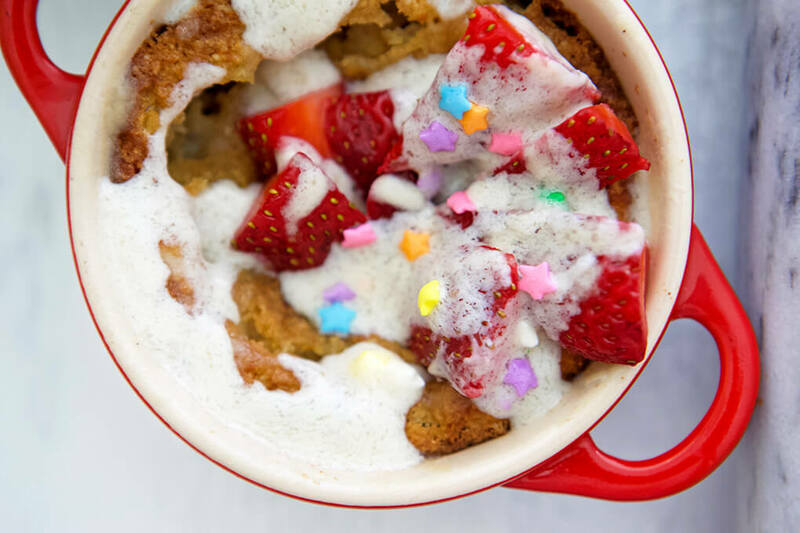 Because it was just supposed to be a mug cake of sorts to fit a single serving, and typically the easiest way to do this is just via the microwave. But then I shared a teaser to my microwave mug cake and a newsletter subscriber emailed me about her disgust with the fact that I promote health and then use the microwave. The irony is that we rarely use the microwave at home. 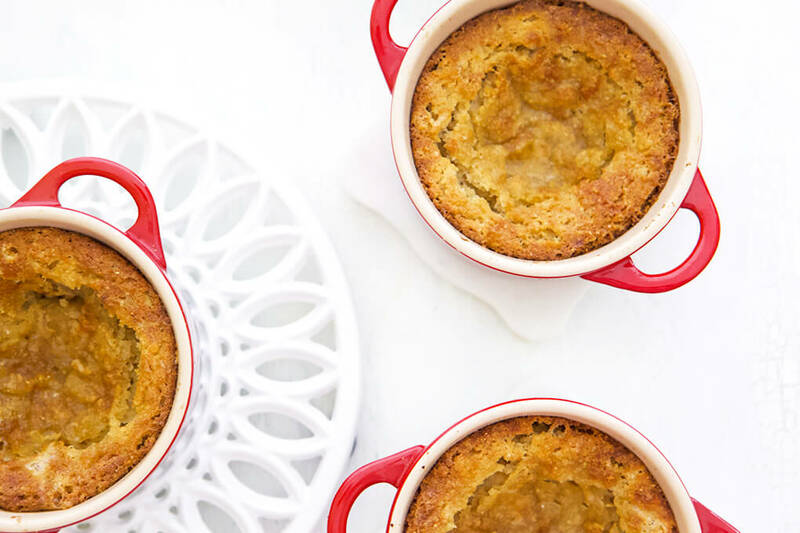 I wouldn’t have even come up with the oven version for this, but I had to because I realized that I would be shooting this recipe at my studio apartment where there is no microwave, only an oven. So I made the recipe for both microwave and oven……because I’m not about to sit here and judge you for how you choose to make it. If you use microwave alternatives 90% of the time, stressing about the 10% is ridiculous. Just right for one. This aspect, the single-serving, is probably what made the recipe such a challenge. It’s hard to make something like this perfect for one, using all the right things in just the right quantities. ….and everyone is going to love it (so you’ll need to make several)! When I told Ryan all the things it didn’t contain, he was impressed. The kids loved it, eating every single bite I gave to them, and they didn’t even get to try it with the strawberries and Vanilla Cake Batter drizzle originally (they did last night; reconfirming their love for the dessert). If you are expecting this to be the traditional Strawberry Shortcake’s identical twin sister, you need to drop those expectations. But there is something to be said about my Strawberry Shortcake for One. 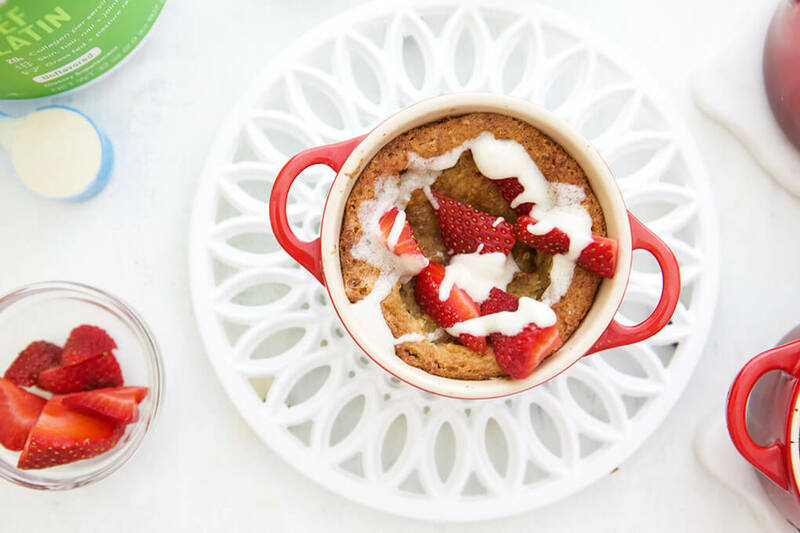 To make this recipe, I used my Le Creuset Mini 8 oz. Cocottes (these are the perfect size for this recipe; microwave and oven safe, so if you don’t use them, choose something similar). Oftentimes I’ll just use coconut oil to coat my pans prior to baking. This time I tried pan spray and used Chosen Foods Avocado Oil Spray. I chose this one because of the clean ingredients and the fact that it is good for baking up to 500 degrees. The Milked Cashews liquid is my favorite cashew milk, by far. 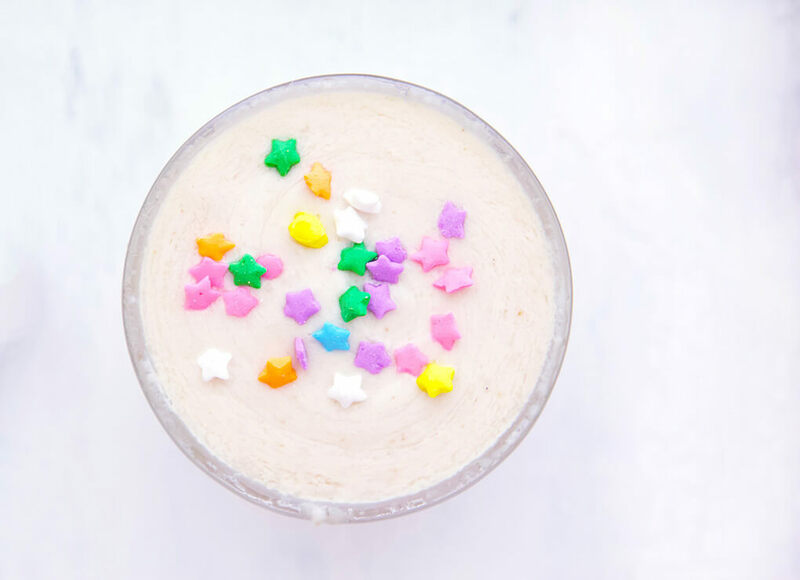 It’s thick and creamy, and the product doesn’t contain any gums or carrageenan. That said, you could use any plant-based milk desired if you want. Stirring in the Gelatin super slowly while constantly stirring is critical. I will add it in, teaspoon by teaspoon, essentially. If you don’t, it will clump. 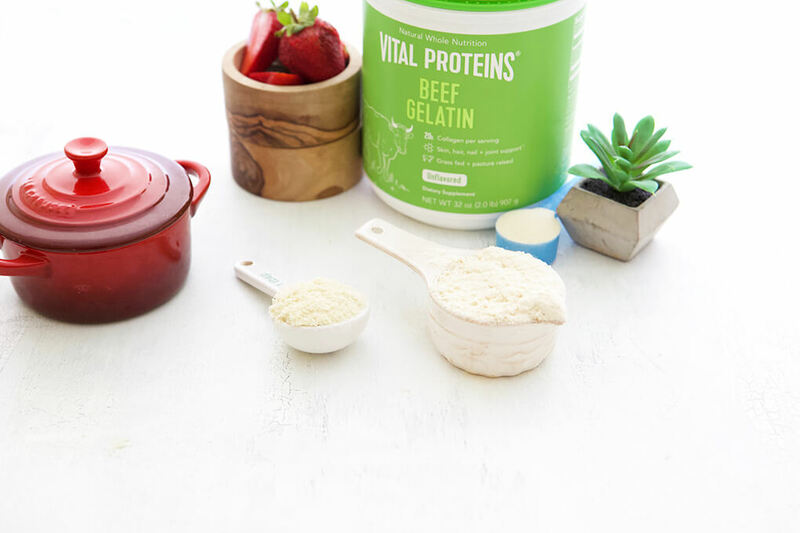 The Gelatin is part of the key to this recipe because it makes the cake a cake without using eggs, while providing an extra gut-healing boost. Want to make this in the microwave instead of the oven? Skip the oven part, and microwave it for about 1 minute and 30 seconds to 2 minutes. No judging from me. 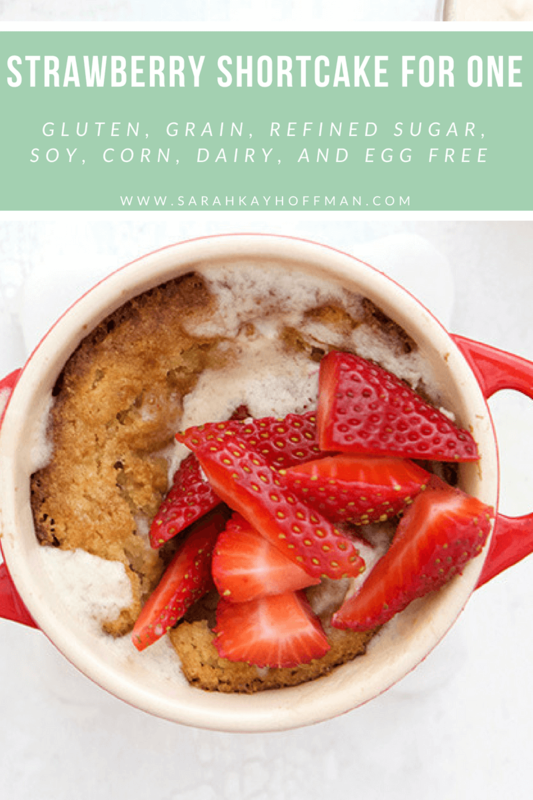 A Strawberry Shortcake for One that's free from gluten, dairy, grains, corn, refined sugar, and eggs. It's Paleo, low-carb, and low-FODMAP'ish. Using oil or pan spray, coat your Cocotte (or whatever you choose to use), and set aside. In one bowl, place the Monk Fruit, Coconut flour and Almond flour. In a separate bowl, place the Almond extract, hot water, and Milked Cashews. Add the Gelatin to the wet mixture super slowly, stirring constantly until it reaches a thick consistency. Add the baking soda plus lemon to the dry mixture and stir. Add the dry mixture to the wet mixture and stir until completely blended together. 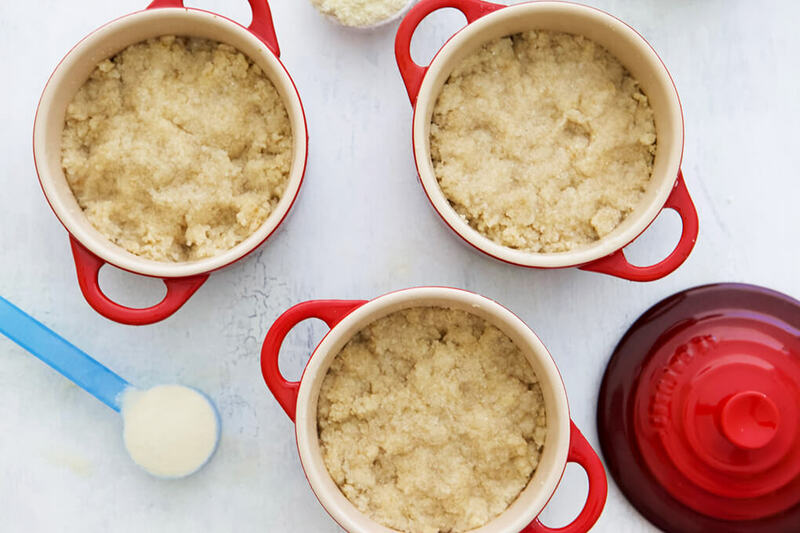 Drop batter into your baking dish, gently pressing down on all sides. Place in the oven for about 28-30 minutes. 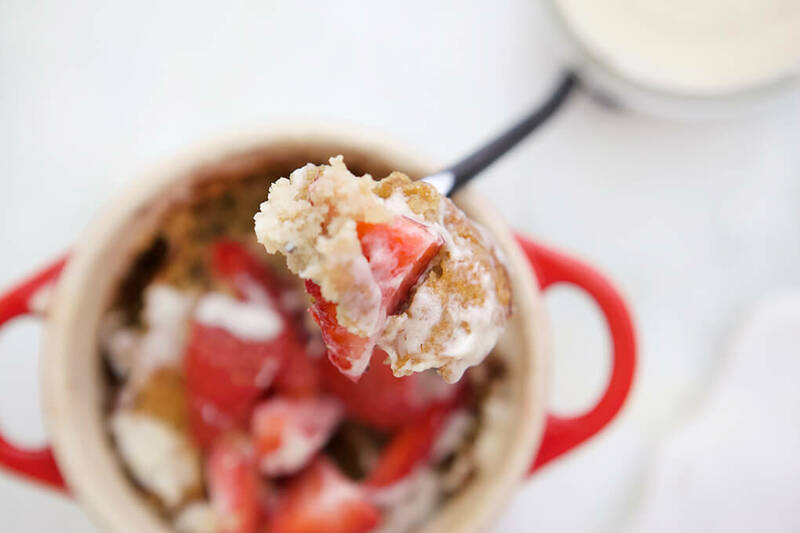 Remove from oven and enjoy with fresh cut strawberries and the Vanilla Cake Batter Drizzle. 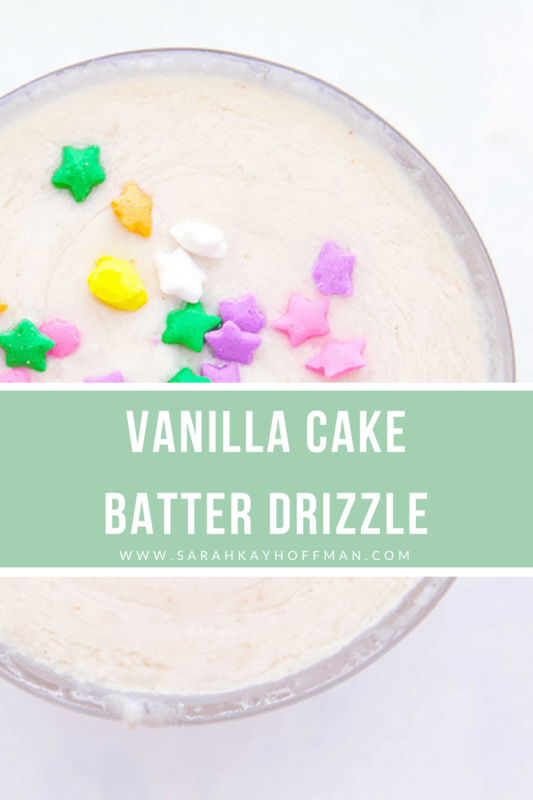 You don’t have to add the Vanilla Cake Batter Drizzle, but I’m tellin’ ya, you’re going to want to. The Strawberry Shortcake for One is totally complete with it. Also, you can use the drizzle for many other cake recipes in the future. 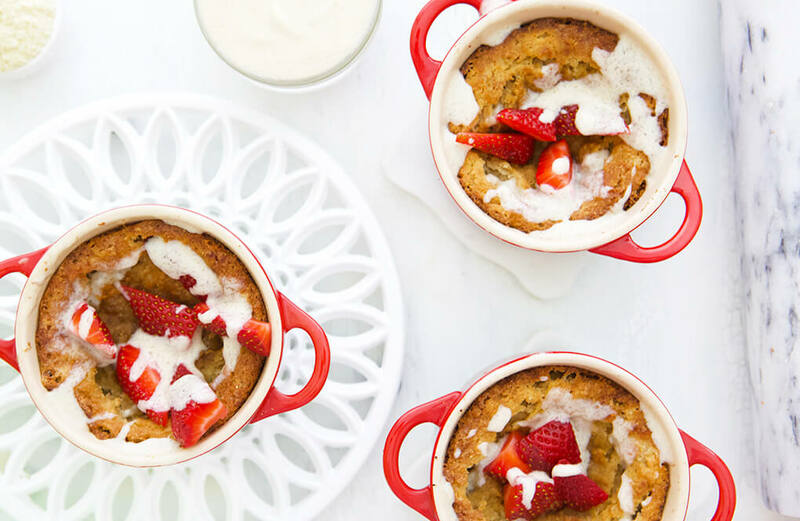 A simple, creamy drizzle to toss over Strawberry Shortcake or any sweet dessert. The drizzle is gluten, grain, dairy, corn, soy, egg, and refined sugar free. Place coconut butter, Vanilla, and ¼ cup coconut milk in a medium bowl and beat on medium-high (with a hand held blender) for a few minutes or until a "whipped" texture forms. Add in the final 1 Tbsp coconut milk, and beat again for about a minute. Add sprinkles (if desired) and pour over dessert of choice. This drizzle won't keep for very long and will harden in the fridge, so it's best to use immediately.